On one side of the blade is an engraving that reads “My honor is my loyalty” which is, indeed, the motto of the SS. The sword’s handle is made out of nickel and wood and has Nazi symbols carved on it. This very rare 37-inch sword, made of Damascus steel, was the symbol of a strong alliance forged on the grounds of acrimony, as one common enemy became a basis for friendship between two distinct bodies. 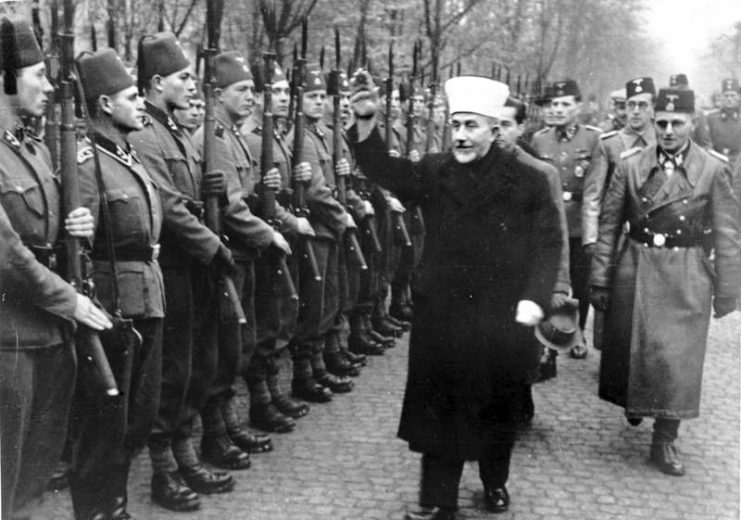 The sword was a gift presented to Haj Muhammad Amin al-Husseini, the Grand Mufti of Jerusalem, by the infamous SS commander, Heinrich Himmler in 1943, during the Mufti’s time in Berlin. 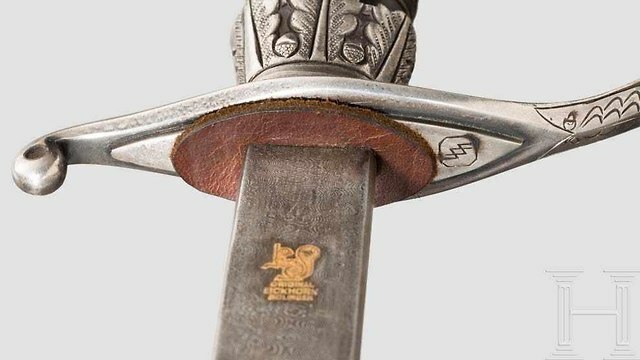 Seventy-five years after the Mufti’s encounter with the Reichsführer, the sword surfaced on a popular British auction site known as The Saleroom. 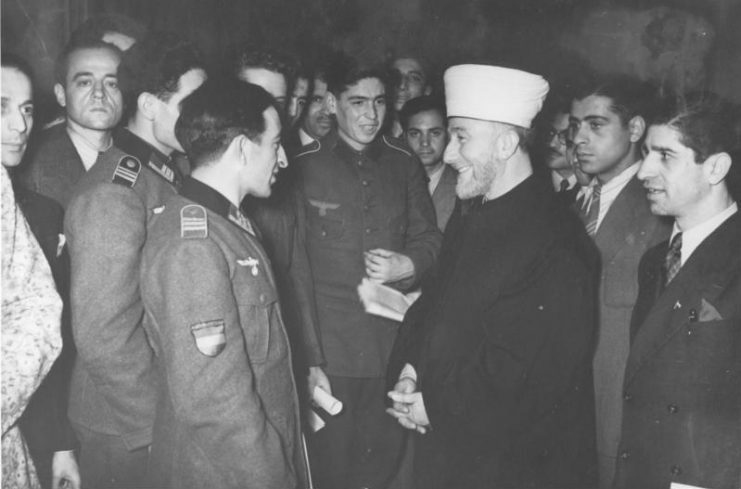 Al-Husseini meeting with Muslim volunteers, including the Azerbaijani Legion, at the opening of the Islamic Central Institute in Berlin on 18 December 1942, during the Muslim festival Eid al-Adha. The sword was a fascinating antique, not just because of its uncommon design, but also for what it represented. Husseini was a very controversial Palestinian Arab nationalist. During his lifetime, he played pivotal roles in anti-Zionist movements all over Palestine. His ideology was deeply ingrained with a long-standing hatred for the Jewish population. During the Second World War, his beliefs brought him close to Nazi Germany. Before the declaration of the Balfour agreement, Palestine (which was then an Ottoman region) had just a tiny population of Jewish inhabitants. However, following the signing of the agreement by Arthur James Balfour, there were speculations that the British government had shown full backing for the Jewish Zionist movement. This would, over the next few years, result in several protests and anti-Zionist demonstrations by the major Palestinian Arab population. In this group, Husseini had a very loud voice. Haj Amin al-Husseini and Nazi collaborator Mile Budak in occupied Sarajevo (1943). 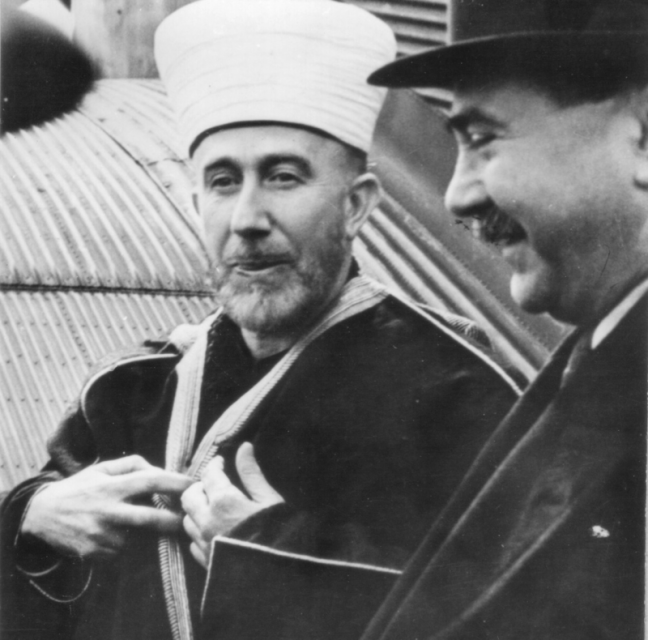 After several disputes and entanglements with the British government, Husseini was made the Grand Mufti of Jerusalem in 1921. Although he was considered, due to his popularity, as a vital ally by the British Mandatory authorities, Husseini continued to promote non-confessional movements against Zionism. In April 1936, the Arab Revolt broke out. This put the Mufti at risk of arrest by the British authorities. In 1937, he fled Palestine. His flight from Palestine in October 1937 would begin his journey towards meeting with Adolf Hitler and Heinrich Himmler. He fled through Jaffa to Lebanon, then from Lebanon he withdrew to Baghdad, Iraq. By then, Germany had begun what would be remembered as the deadliest conflict in history—World War II. 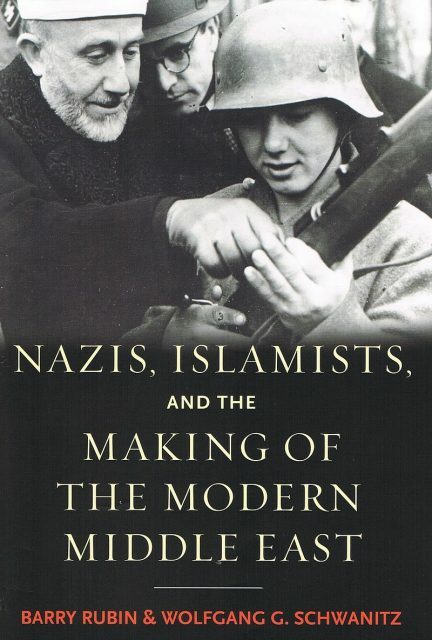 During his stay in Iraq, Husseini established closer ties with Nazi Germany. Following the reclaim of Iraq by the British, Husseini was moved under the protection of the Italian government into Axis Europe. In Italy, he met with Benito Mussolini, who just like him, shared great hatred for the Jews and Zionism. Mussolini also approved the Mufti’s written declaration of support for the Axis and facilitated its transfer to the German embassy. 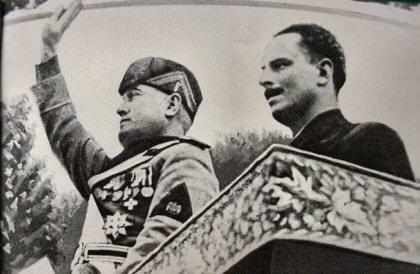 Italy’s Duce Benito Mussolini (left) with Leader Oswald Mosley (right) during Mosley’s visit to Italy in 1936. 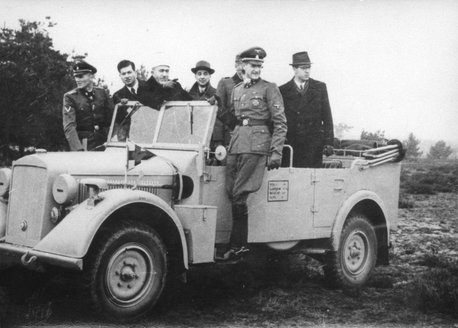 Husseini arrived in Berlin on November 6, 1941. On the 28th of November, he had a 90-minute-long meeting with Adolf Hitler. 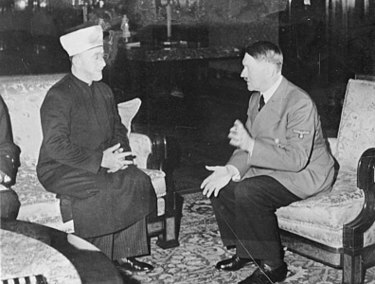 At this meeting, one of Husseini’s requests was that, during the Jewish extermination in Europe, Hitler should not expel any Jews to Palestine. Although there was no public declaration by Hitler specifically stating that he would eliminate the Jews from Palestine, a telegram which may have suggested otherwise was found in Israel’s National Library. The telegram was published on March 29, 2017, on the library’s blog. It was said to have been written in 1943 by Heinrich Himmler and sent to Haj Muhammad Amin al-Husseini. 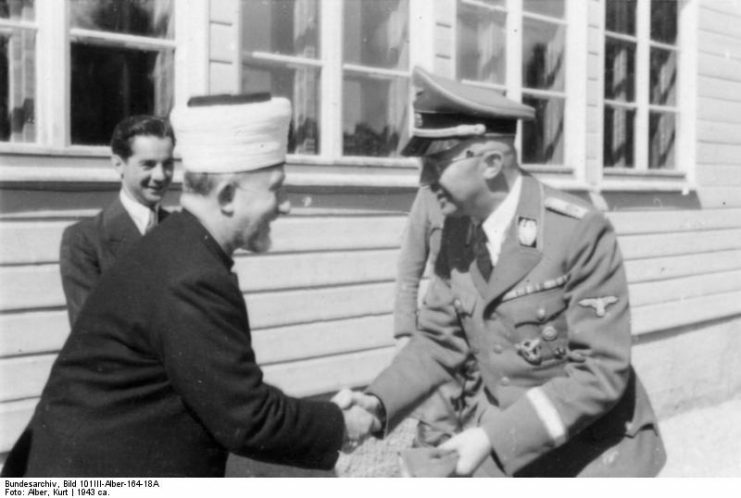 Haj Muhammad Amin al-Husseini received the highly valued sword from Himmler in 1943 during his stay in Berlin, and this gift would be a seal upon the relationship that grew between the Third Reich and the Arab people as represented by Husseini. 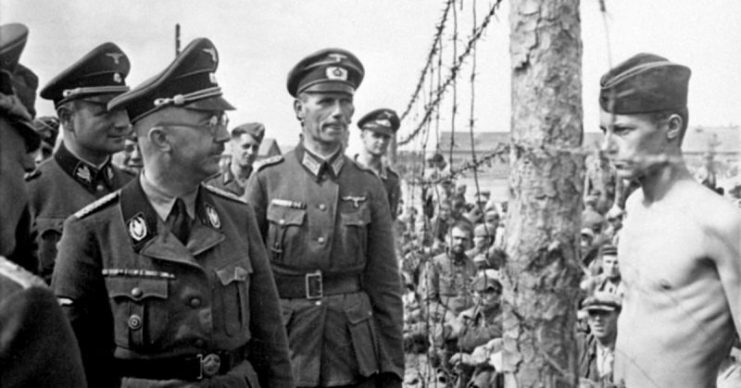 Heinrich Himmler visiting a Prisoner of War camp during World War 2. The prisoner is claimed by some to be a British soldier, Horace Greasley. This sword was revealed in November last year on The Saleroom by Hermann Historica, a leading German auction house for historical items. 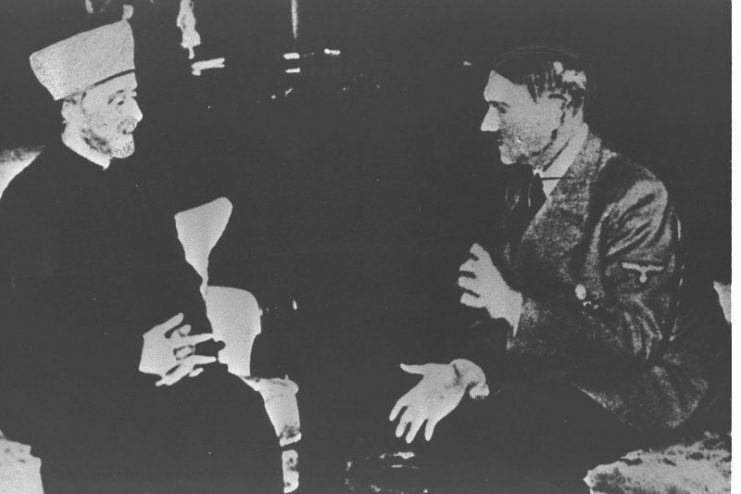 About five months before the auction of the Mufti’s sword, the Israel-based auction house, Kedem Auctions, released six never-before-seen photographs of the Mufti’s meeting with Adolf Hitler and Himmler. Each of the photographs left the auction block at the price of $12,000. Husseini had, in recent years, returned to the headlines following claims by Israeli Prime Minister Benjamin Netanyahu who made a very bold assertion during the 37th Zionist Congress. Netanyahu stated that Adolf Hitler’s intention to launch the Final Solution had existed without resolve until Husseini made his entrance. 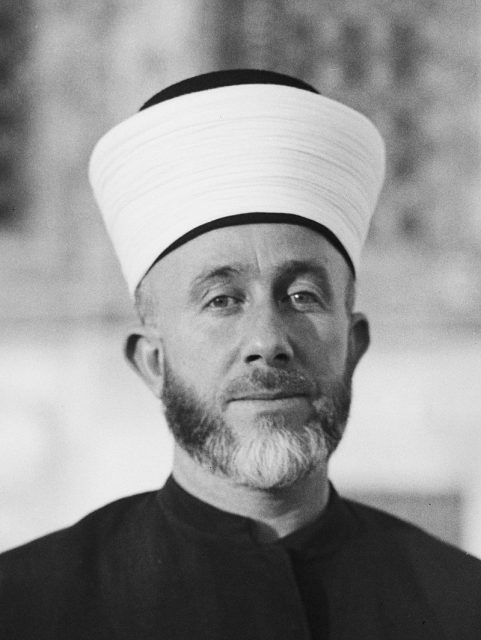 The Mufti brought with him fuel for the fires that would later consume millions of Jewish people. However, this claim was widely disputed by several Holocaust scholars all over the world.